What Is The Best Hunting Knife? 2 How Much Do Hunting Knives Cost? 4 How to Choose the Best Hunting Knife? Choosing the best hunting knife in today’s wide market offerings is a tricky task to accomplish. We’ve put together this buying guide to help you to buy the best hunting knife in the world. At the bottom of this article, you will find short hunting knife reviews with links to detailed customer reviews. A hunting knife is a kind of knife that is used mainly to prepare the game as food. This means that its main use is to skin the animal and to cut the meat. As you may know, we’ve already discussed dedicated skinning knives, so today we will be taking a look at all-purpose hunting knives. In order to prepare the game, your knife is of most importance. What we are going to be taking into consideration are aspects such as price, efficiency, longevity, and quality. How Much Do Hunting Knives Cost? As far as price is concerned, hunting knives can range from as low as $8 to even above $100. What we are essentially looking for is something that will not make a hole in your pocket and at the same time, will not compromise on quality. One question you might ask is: How do we know if the knife is really any good when it comes to practical application? For that purpose, we are going to be taking a look at Amazon user reviews. User reviews are usually the best benchmark to gauge how good the product is considering that it comes from actual user experience of the product. Another aspect we look for is the build quality. Many knives come with gut hooks that are supposed to assist better when it comes to skinning the game. The gut hook can be handy for cutting the animal properly without ruining the meat. One more important thing to keep in mind here has to do with the types of hunting knives. Broadly, there are two types of hunting knives. One is the fixed-blade hunting knife and the other is the folding-blade knife. The fixed-blade knife is the knife with the blade fixed and usually comes with a sheath to cover the blade. The folding-blade knives come with a blade that can be folded into the handle. Thus, a folding-blade knife consists of moving parts while a fixed-blade knife has no moving parts. This can have a direct bearing on the durability of the knife in many cases. These are some of the things to be taken into consideration when buying a hunting knife. How to Choose the Best Hunting Knife? What knife you buy depends entirely on what kind of hunting you are going to be doing. It also largely depends on how often you will be hunting. For example, if you are a frequent hunter, you might want to take into consideration knives that come with a lifetime warranty and ones which are coated with titanium nitride. Titanium nitride protects the edge of the knife and prevents corrosion. There are several knife manufacturers which provide knives that have a lifetime warranty that goes with them. These knives usually are a bit expensive but well worth the investment. Another often overlooked part of the knife is the handle itself. The handle needs to be sturdy and made of good material. Several high quality knives come with a rubber handle and are quite safe to use. There are also several knives built to stand adverse weather conditions. This is where the handle becomes very important. You are better off with a knife that has a handle which can provide good grip regardless of the weather conditions. There are also serrated knives out there which are basically knives with blades that have a saw tooth kind of blade. The serrated blade might be handy for a greater overall applied pressure but it can even result in uneven or imprecise cuts, consequently ruining the meat. However, there are knives with partially serrated blades as well. So, when considering the purchase of a hunting knife, not only is it important to look at the specifications of a knife, it is equally important to go beyond the specifications stated on paper and be well informed about what really constitutes a good hunting knife. The famous British adventurer Edward Michael Grylls of Man vs. Wild fame lends his name to the knife. At first glance, you’ll notice that the knife is partially serrated. Now, in a lot of cases, when used properly, these types of serrated knives can be extremely useful. The overall knife length is 10 inches with the blade being 4.75 inches long. Since the blade is partially serrated, it helps in an increased pressure being applied at the edge, which consequently results in quick cuts. 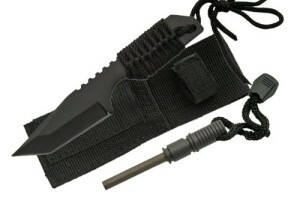 The knife comes with a very handy fire starter and a nylon sheath. Along with the knife, you also get a “Priorities of Survival” guide that can prove to be quite useful and is waterproof. The nylon sheath is mildew resistant and can stand harsh climatic conditions. Not just that, you also get a diamond sharpener which is integrated into the sheath. This is excellent addition for on-the-go sharpening. You also have a stainless steel pommel at the base of the handle of the knife, which can be used for hammering. The knife does come with limited lifetime warranty as well. So, overall, this is an excellent product at the price it is being sold at and the features that it offers. 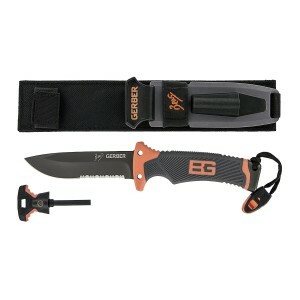 Click here to buy the Gerber 31-000751 knife on Amazon! This knife is one of the best reviewed knives on Amazon, with average score of 4.8 out of 5 from over 150 reviews. The overall length of this knife is 1-3/4 inches and it has a partially serrated edge. It is made up of Cro-Van steel, which helps in the resistance of corrosion and abrasion owing to chromium and vanadium. Now, the design of this one is fixed-blade and the length of the blade is really good at 7 inches long. Almost all the users say that it holds its edge very well and that it has a good grip. Going by the user reviews alone suggests that this is a great knife with a good, sharp edge. One would be hard-pressed to find anything negative about the knife itself. However, the sheath is the only thing we can think of which could have been better. This is because it does not come with a velcro or any kind of button straps so the user can attach the knife to the belt. Other than that, there is no reason to not consider this. Click here to buy the KA-BAR Fighting/Utility Serrated Edge Knife on Amazon! The Cold Steel Gi Tanto Knife is one of the best in the $20-$40 price range. We have here an impressive knife with a blade 7 inches in length and the handle being 5 inches, the overall length is 12 inches. Now, the sheath on this knife looks very impressive and it is well built. The knife can also be converted into a spear or a war club by removing handle scale and attaching the knife to a wooden shaft. As far as price-performance ratio goes, this knife is excellent. The secure-ex sheath is far superior to the nylon sheath offered by various other knife manufacturers. Almost all the users have only positive things to say about the knife. Right out of the box, the knife is very sharp and the secure-ex sheath prevents it from rusting so make sure to get it with the secure-ex sheath. Overall, this knife is a bang for the buck and can withstand rough usage as well. Click here to buy the Cold Steel 80PGTK GI Tanto 7″ Carbon knife on Amazon! Looking at this knife, the first thing you can notice is the handle of it. Yes, it is a full tang knife, which means that the blade runs full length and extends to the handle. Also, the handle is cord-wrapped, and is fairly strong. Another thing you will notice is, of course, the fire starter. Now, the cord wrapped around the handle, on the first, glance looks cheap, and if you thought so looking at the knife, you are right. But you can’t expect a whole lot more for the price that the knife is sold. You can remove the cord that came along with the knife and wrap any other stronger cord to the handle. The knife comes with a sheath as we can see in the picture. The knife is 7 inches in length, which does make the knife quite small compared to several others out there but that is not solely something you can dismiss it for. As for the sharpness, nothing very impressive here, it’s enough to get the job done, although you might have to sharpen it several times to retain the edge of the knife. Overall, not a bad buy for the price. Click here to buy the Tanto Survivor Fire starter Knife on Amazon! It’s been said many times over – Buck knives are some of the most iconic and famous knives in the US and maybe even in the whole world. The Buck Knives 0119 fixed blade bowie knife is a reasonably priced model with 6-inch blade made of 420HC steel, which gives it exceptional sharpness and edge retention. The handle is made of black phenol and features aluminum pommel and guard. The synthetic material gives the handle the ability to safely withstand bad weather conditions and provides secure grip. Just like other Buck knives, the 0119 model is backed by the Buck Forever warranty. 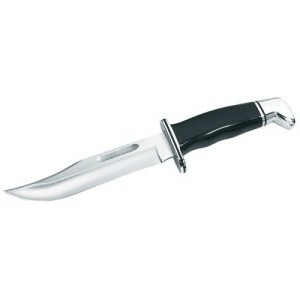 In terms of customer satisfaction, this knife is one of the best rated hunting knives. Overall, given its reasonable price and exceptional ratings, this is could as well be the best hunting knife for the money. Click here to buy the Buck 119BKS Spec Hunting on Amazon!